PAWS Workholding has announced it will be displaying it’s Workholding products at the IMTS 2014 (International Manufacturing Technology Show). The show will be held at the McCormick Place in Chicago. The event is scheduled to run from Monday September 8, 2014 through Saturday September 13, 2013. PAWS Workholding will be displaying a variety of automated clamping solutions for production CNC Milling applications. 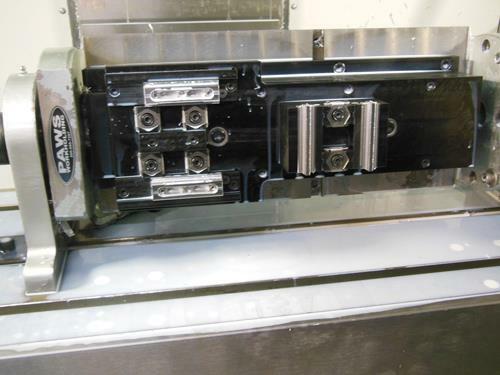 These solutions include several examples of “Multiple-Part Workholding” applications using a variety of clamping methods such as the PAWS Multi-Vise, 5C Collet, I,D. Collet and 4th axis trunnion solutions. PAWS Workholding has announced it will be displaying it’s Workholding products at the AMTS 2013 (Advanced Manufacturing Technology Show). The show will be held at the Dayton Airport Expo Center in Dayton Ohio. The event is scheduled to run from Wednesday October 23, 2013 through Thursday October 24, 2013. Click here to get more information on the trade show or to get registered. 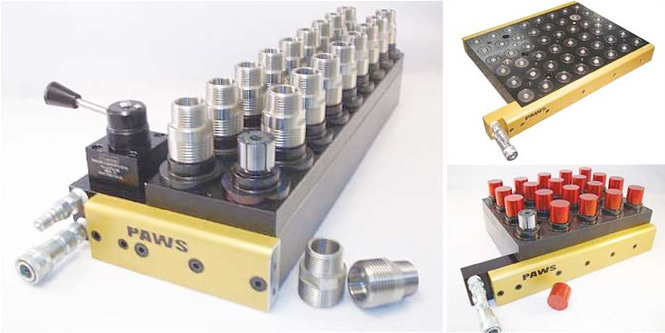 PAWS Workholding has developed a modular 5C Collet Clamping System to use in production milling applications. 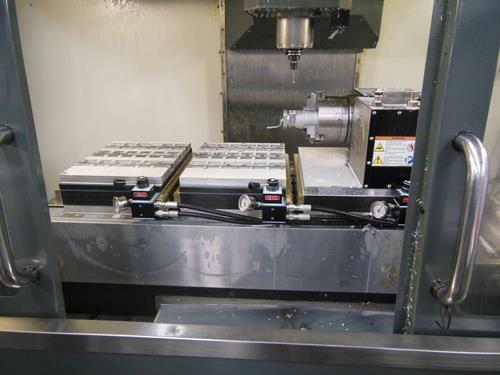 “The hydraulic clamping 5C collet system is designed to incorporate multiple-part workholding with fast, efficient clamping in order to maximize spindle cut time and density of parts in the milling work space,” said a PAWS Workholding spokesperson. The system comes in two standard sizes, a 12″ x 16″ 24-station unit and an 8″ x 10″ eight-station unit. The 5C fixture plate is removable from the hydraulic base plate (non-dedicated) so other fixture plates can be utilized with the system. 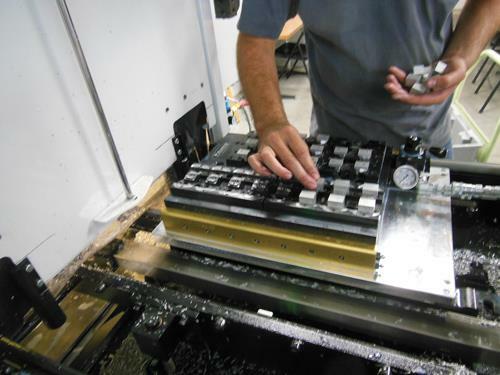 Options include an accumulator package for pallet switching applications and engineered, turn-key solutions for those looking to have part programming, tooling and installation handled by the PAWS’ team of Workholding Specialists. PAWS Workholding has announced it will be displaying it’s Workholding products at EasTec 2013. The show will be at the Eastern States Exposition Center in West Springfield Massachusetts and is scheduled to run from Tuesday, May 14, 2013 through Thursday, May 16, 2013 . PAWS Workholding will be displaying a variety of automated clamping solutions for production CNC Milling applications. 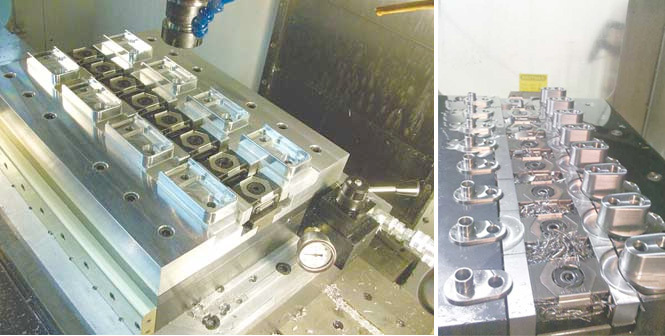 These solutions include several examples of “Multiple-Part Workholding” applications using a variety of clamping methods such as the Multi-Vise, 5C Collet, I,D. Collet and 4th axis trunnion solutions. PAWS Workholding has announced it will be displaying it’s Workholding products at HaasTec 2013. Haas will host the open house at their Oxnard, CA facility and has scheduled four full days of activities. The show is scheduled to run from Tuesday, April 09, 2013 through Friday, April 12, 2013. PAWS Workholding has announced it will be displaying it’s Workholding products at PMTS 2013. The show will be at the Greater Columbus Convention Center in Columbus, Ohio and is scheduled to run from Tuesday, April 16, 2013 through Thursday, April 18, 2013. Click here for more information on the trade show or to get registered.